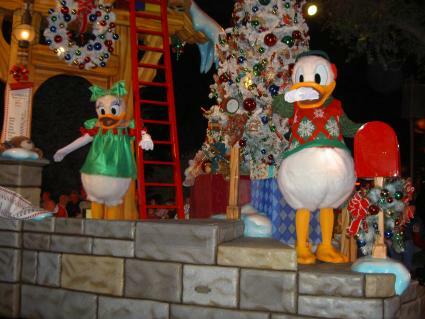 Daisy and Donald Duck get into the holiday spirit at Disneyland. If you are planning a Disney vacation for Christmas, know you are visiting the popular theme park during the most magical time of year. The winter holidays at any of the Disney resorts are full of magic, wonder and excitement -- not to mention some snow if you are lucky! It doesn't matter if you are going to Disneyland in Southern California or the Magic Kingdom in Orlando, Florida, your Disney vacation will be one to remember. Beginning around mid-November, the theme parks magically transform from the harvest and Halloween theme to a winter and Christmas paradise filled with Santa Claus, reindeer and the smell of gingerbread cookies. Decorations: Make sure to bring your camera so you won't miss any of the festive holiday decorations throughout the parks. Candlelight Processional: This holiday tradition brings a full orchestra, a choral ensemble and a candlelight procession through the theme parks. The traditional story of Christmas is then told through words (narrated by a celebrity) and music. Castle Dream Lights: Roughly 200,000 twinkling lights brighten up Cinderella's castle. Holiday Fireworks: Listen to traditional Christmas songs as fireworks fill the sky. At Disneyland in California, snow starts to fall throughout several areas of the park. Christmas Parade: Whether it's a "fantasy" parade or one dedicated to Mickey Mouse's holiday, Disney's parades are a joy to watch -- dancing reindeer, snowmen and a glimpse of ol' St. Nick are enjoyed by guests. Santa Claus and Friends: Spend a few minutes with Santa and Mrs. Claus (and his reindeer too) in his special and festive house. You can even get your family picture taken with the jolly man too. While the Christmas holidays may be the most magical time of year to go on a Disney vacation, it is also one of the busiest. Starting around a week or two before Christmas and lasting through New Year's Day, crowds at the Disney theme parks will be some of the largest of the year. Wait times on all of the major rides and attractions are high and at times, the parks may have to temporarily close because of capacity levels. If you want to enjoy a Disney vacation for Christmas, plan on going either around the first week of December or after New Year's Day. Decorations go up the week before Thanksgiving and are taken down the first week of the new year. You will not want to visit the park on any of those major holidays, as the parks are very busy those days. Weekdays are busier than weekends, and visiting during the daytime is less crowded than at night, as many locals with annual passes come to the parks to see the nighttime holiday parades, fireworks and if applicable, snow. Book your trip early. Airfares and hotels increase their prices around the holidays, so the sooner you make your travel reservations, the better discount you will receive. Plan your time wisely. If you are visiting the Disney theme park specifically for the holiday decoration and attractions, then make sure you do just that. Don't spend time on rides or attractions that have done before or that you can do anytime during the year. Stick to your budget. It's very easy to get carried away buying souvenirs and Christmas presents. Besides breaking your bank, you will need to get those items back home. With limitations now placed on the amount of luggage you can take on a plane, those extra trinkets and sweatshirts can cost you more than you expected. Make meal reservations. Disney restaurants, especially those with character dining, fill up quickly. If you are planning to have a few nice meals while on your trip, reserve your seats early. You can always cancel if your plans change. Purchase park tickets online. Buying your theme parks online can save you a few extra dollars. AllEars answers many of the questions families may have including where to eat and what to do on Christmas Eve. Disney World Info lists all of the Walt Disney World's holiday events. MiceChat is a forum where members can give advice and opinions about the theme parks. LaughingPlace has a personal guide to Christmas at Disneyland including photos and calendar listings. MouseSavers has a step-by-step guide to enjoying any of the Disney theme parks at Christmas. Christmas at Disney is such a magical time for children and adults. If you are able to afford a trip for the holidays, take your time and research all of your options before booking your tickets.